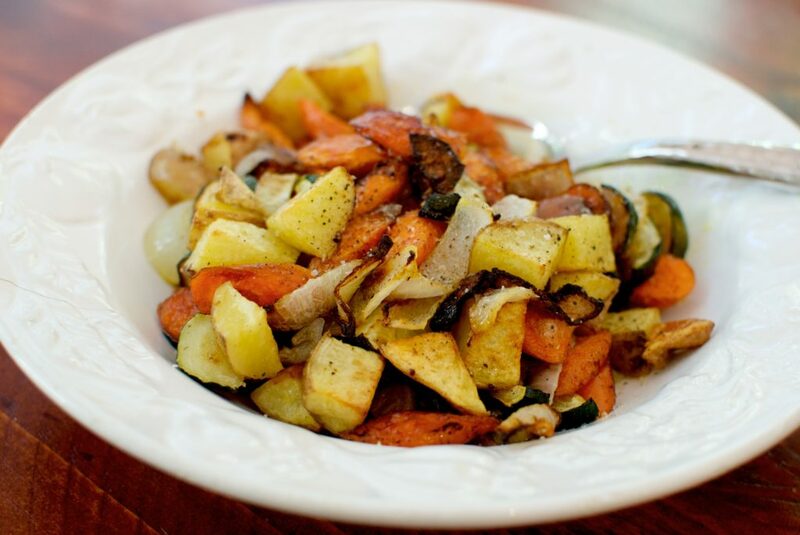 roasted vegetables are a simple side dish to make any night of the week. 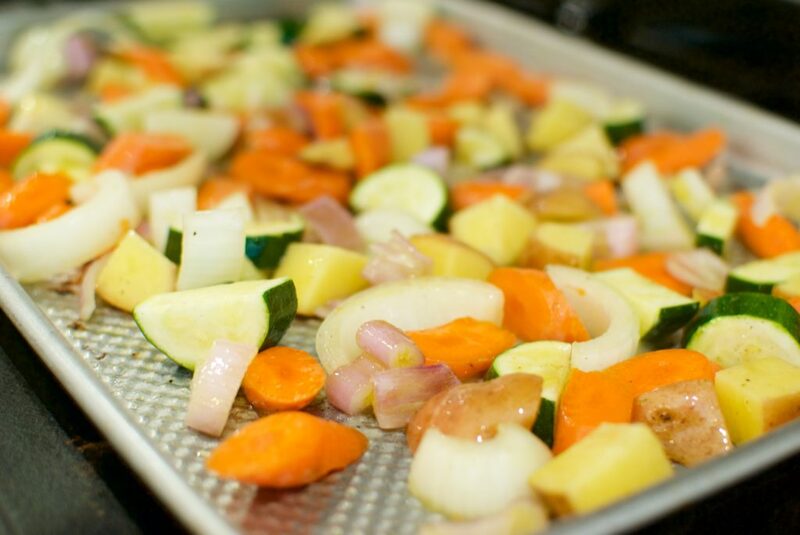 With these easy tips, you’ll have perfectly seasoned and cooked vegetables in no time. I love roasted anything — chicken, beef, salmon, vegetables, fruit, you name it! When I host dinner parties, there is almost always a roasted vegetable. Why?? Because it is a no brainer, and so simple. It’s what I call a “Toss it and forget it!” method of cooking, and one every home cook should know. 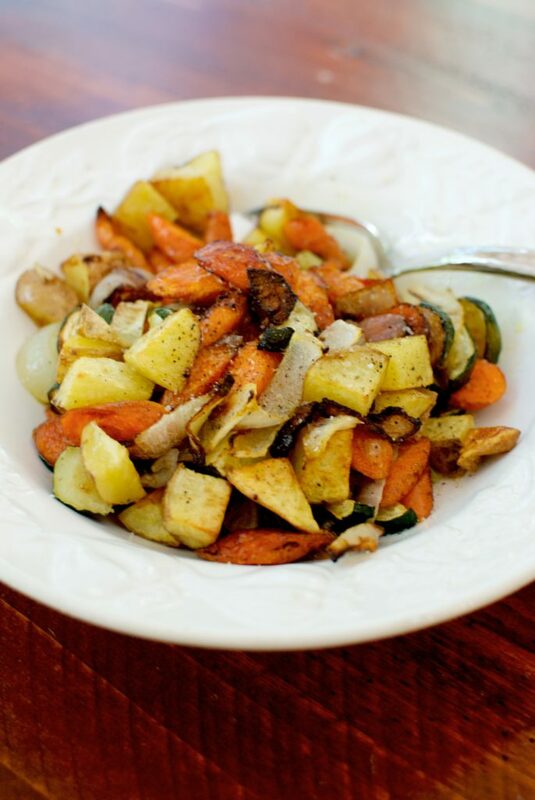 Roasted vegetables are a staple for meal prep, or any meal side dish. A 425˚ oven. And nothing lower — seriously. Accurate knife cuts — all the same size. Roast long enough to brown and crisp properly. 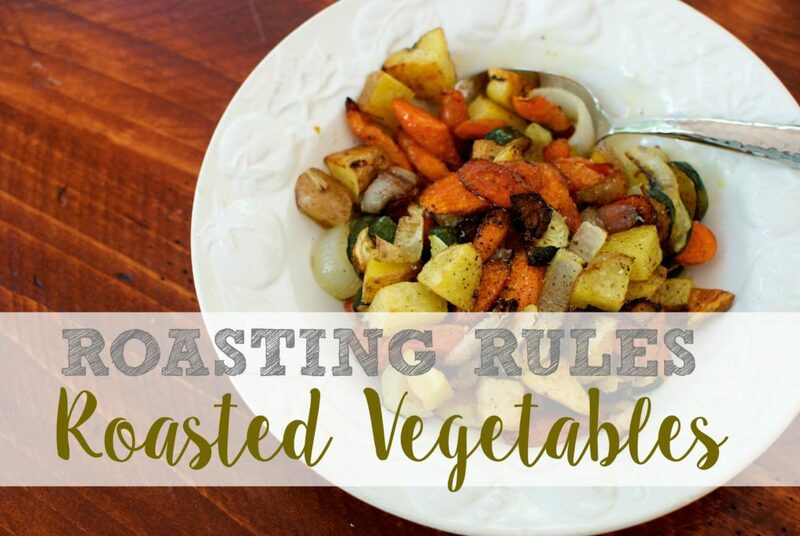 These four simple rules will help guide you to roasted vegetable heaven in a matter of minutes. 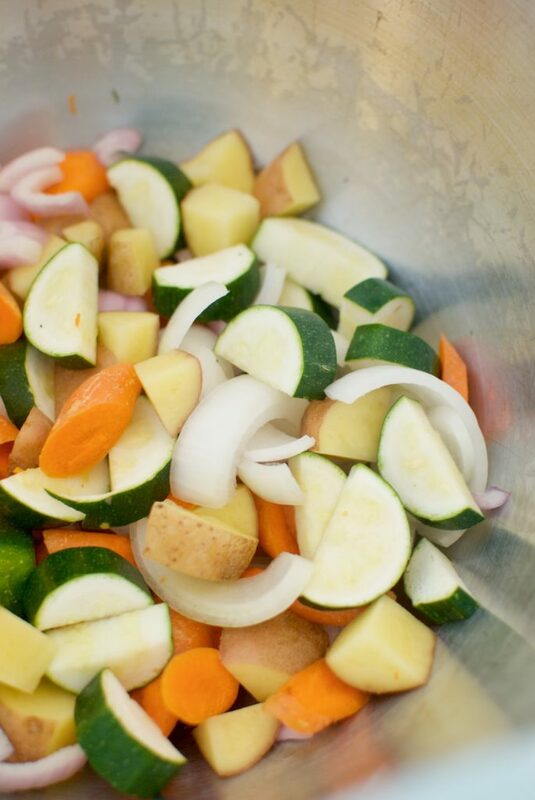 Vegetables like the ones pictured: zucchini, onions, potatoes, and carrots take about 20-25 minutes. You can even throw in whole cloves of garlic — fish them out, and smash into butter for the most delicious garlic butter you’ve ever tasted! A secret rule to roasting — DO NOT PEEK. Do not open the oven, not only are you lowering the heat each time, there is no reason to open the oven over and over. This “recipe” is almost foolproof, and you really can’t burn the veggies. Unless you forget about them…. YIKES! Set a timer for 20 minutes to begin, and then open the oven to see how it’s going. Begin by chopping your vegetables, and dumping into a large bowl. Swirl a few glugs of the EVOO (Extra Virgin Olive Oil) bottle around the bowl — followed by a sprinkle of kosher salt and freshly ground pepper. Toss with your hands, and dump onto a sheet pan. Another secret rule: ONE LAYER. 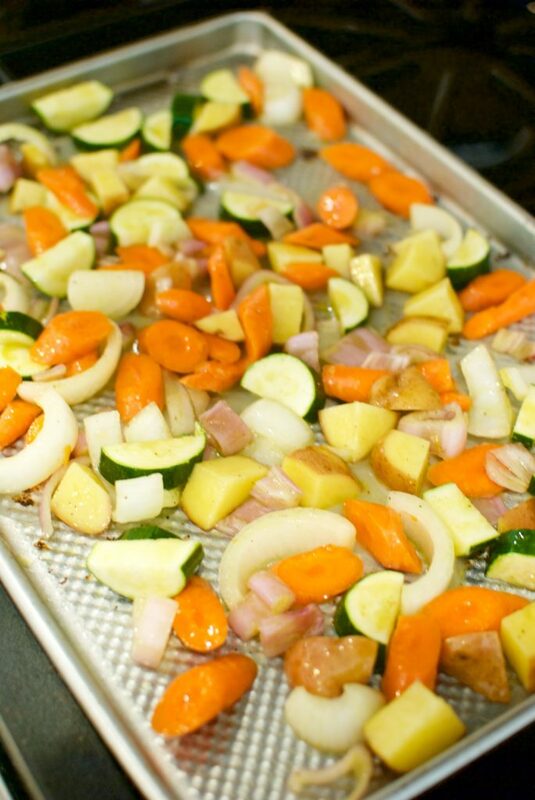 Don’t crowd your sheet pan — let the vegetables have room to breathe. Place in the oven and shut the door! 20 minutes later, open the door (watch out for the steam that will escape! ), and give the pan a shimmy shimmy shake. Once brown and crispy, remove from pan onto serving platter and serve immediately! 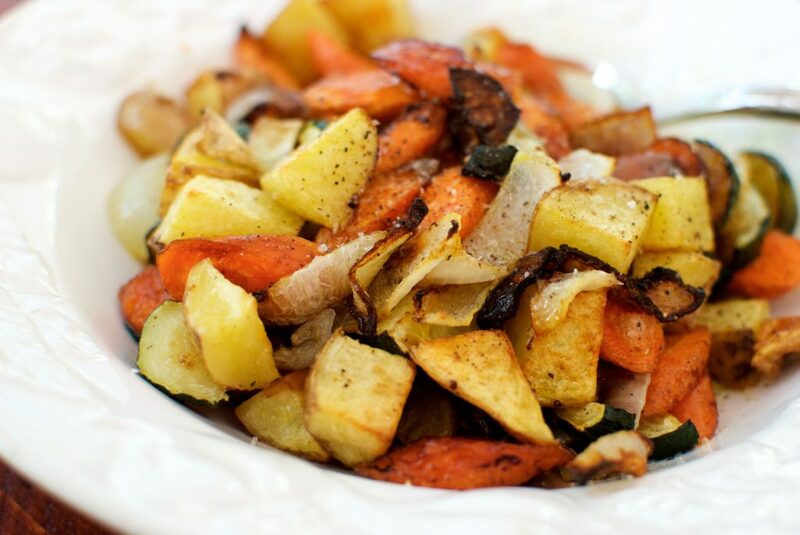 Roasted vegetables are the easiest side dish you'll ever make! And maybe the most delicious! 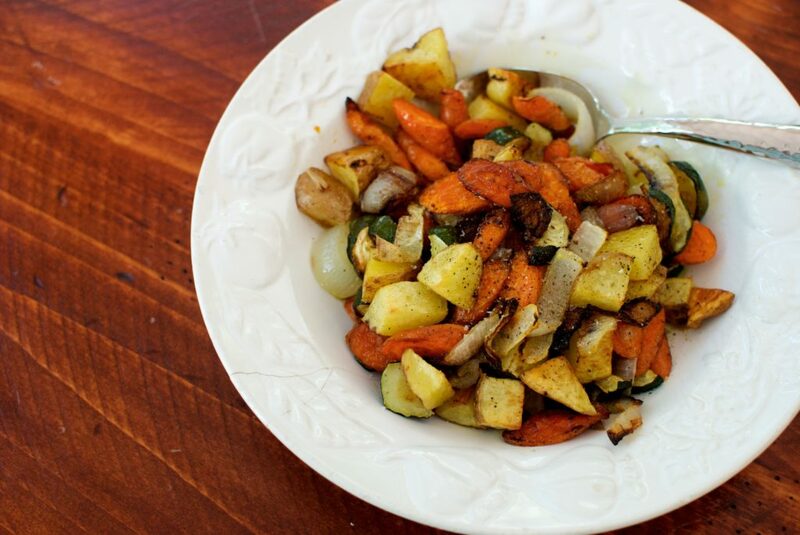 Chop vegetables, and toss with EVOO, salt and pepper in a large bowl. Pour out on a half sheet pan, and roast for 20-25 minutes. Serve immediately. How do you roast vegetables?? Any secrets you have?? Beef tenderloin and French Roasted Chicken make the perfect main dish for your roasted vegetables! These look delicious!! Is that a special sheet pan you’re using? Have you found a textured bottom of the pan helps at all? I have all kinds of half sheet pans — my favorite are the aluminum ones from restaurant supply stores.Super cheap! But, these are ‘baking sheets’ from Wilton. I think they are meant for cookies, and air can circulate underneath. I can’t tell a difference, but I haven’t paid that much attention! These look so good! You have inspired me to make some roasted root veggies tonight for dinner and for salad toppings the rest of the week. Thank you! Yes!! Also, whirling the leftovers with some vegetable stock makes a fabulous soup! Yes! It’s a perfect “rule” to teach a kiddo! My kids even roast vegetables in the toaster oven! Woo hoo! Can’t wait to hear what you think!